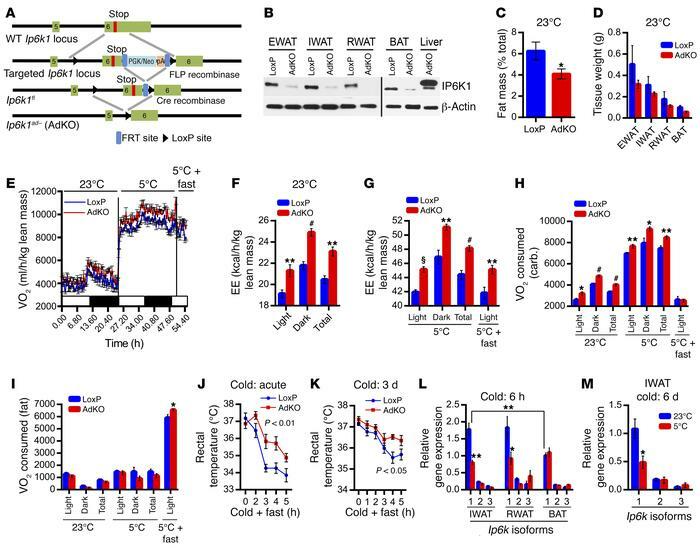 Adipocyte-specific Ip6k1-deleted mice accumulate less fat because of enhanced thermogenic EE under chow-fed conditions. (A) Generation of AdKOs. Details of the knockout generation strategy are described in Methods. (B) Immunoblot analyses confirm deletion of IP6K1 protein from various adipose tissue depots. Detection of residual IP6K1 is due to the presence of macrophages and other immune cells in the adipose tissue. Liver samples from AdKO mice were run as a control. BAT and liver samples were run on a separate gel. Blot represents data from 3 independent experiments. (C) CD-AdKOs (8 weeks old) display significantly reduced percentage fat mass (n = 10 mice per group; t test). (D) Weights of diverse adipose tissue depots are marginally less in CD-AdKOs (n = 4 mice per group; t test). (E) VO2 is higher in CD-AdKOs at 23°C and following cold and cold + fasting exposures (n = 8 mice per group). (F and G) EE is higher in CD-AdKOs under the above-mentioned conditions (n = 8 mice per group; t test). (H) CD-AdKOs consume more oxygen to oxidize carbohydrate at 23°C and 5°C (n = 8 mice per group; t test). (I) Following acute fasting at 5°C, CD-AdKOs consume more oxygen for fat oxidation (n = 8 mice per group; t test). (J) CD-AdKOs maintain body temperature more efficiently than LoxPs following acute cold + fasting exposure (n = 8 mice per group; 2-way ANOVA). (K) CD-AdKOs are also partly protected against drop in body temperature induced by chronic cold (3 days) and acute cold + fasting (n = 8 mice per group; 2-way ANOVA). (L) Ip6k1 is the major Ip6k isoform in the adipose tissue, which is downregulated by acute cold exposure in IWAT and RWAT. Ip6k1 expression is lower in the BAT and is not further reduced by cold (n = 5 mice per group; 2-way ANOVA). (M) Chronic cold also specifically reduces Ip6k1 expression in IWAT (n = 6 mice per group; t test). Data in all panels are expressed as mean ± SEM. *P < 0.05, **P < 0.01, #P < 0.001, §P < 0.0001.